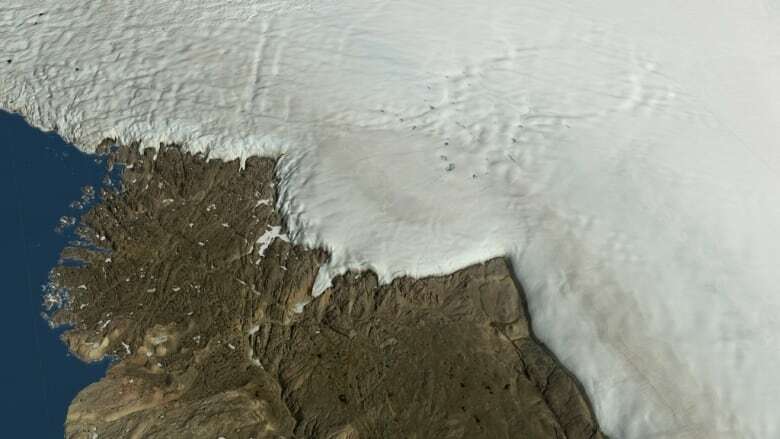 An international team of scientists has found one of the largest impact craters on Earth, buried a kilometre under the ice in Greenland. It's evidence of a catastrophic collision that could have happened at the same time as humans were spreading into North and South America. "We didn't know there were any impact craters beneath ice sheets" NASA Glaciologist Joe MacGregor told Quirks & Quarks host Bob McDonald. "This was not a question I'd pondered at all previously." The first hints came from ice-penetrating radar scans done from aircraft. 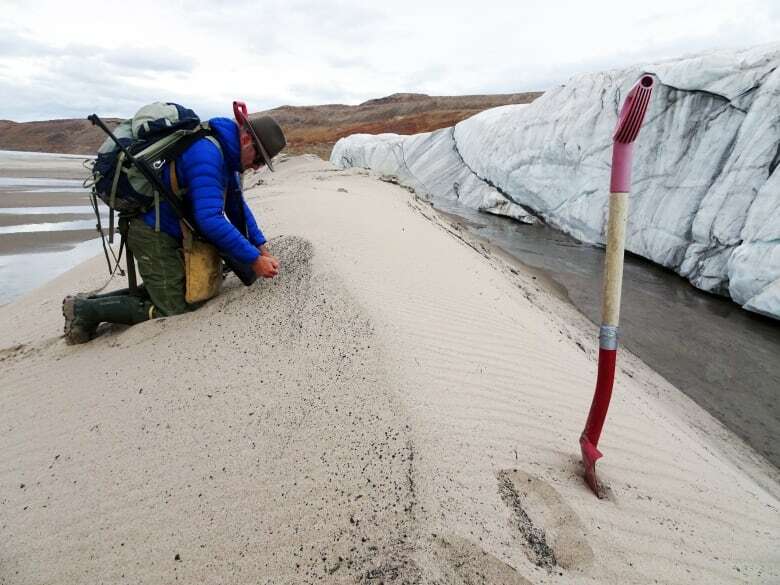 Danish researcher Kurt Kjær noticed an odd, circular shape in the topography underneath the Hiawatha Glacier on the northwestern tip of Greenland. He contacted MacGregor, who works with NASA's Operation IceBridge, flying over glaciers to map their thickness. Macgregor pulled up radar maps from their flights over Greenland. "What I could see was evidence of an elevated rim around the edge, and then when you plotted those points, they fit a nice circle," said MacGregor. This led to more scanning flights to capture more details, and to expeditions collecting samples of ice and debris on the ground. The team confirmed their findings in a study published in the journal Science Advances this week. It's the first impact crater found under an ice sheet and now ranks as one of the largest impact craters on Earth. The age of the crater hasn't yet been confirmed, but the kilometre-thick ice sheet over top of the crater gives some clues. 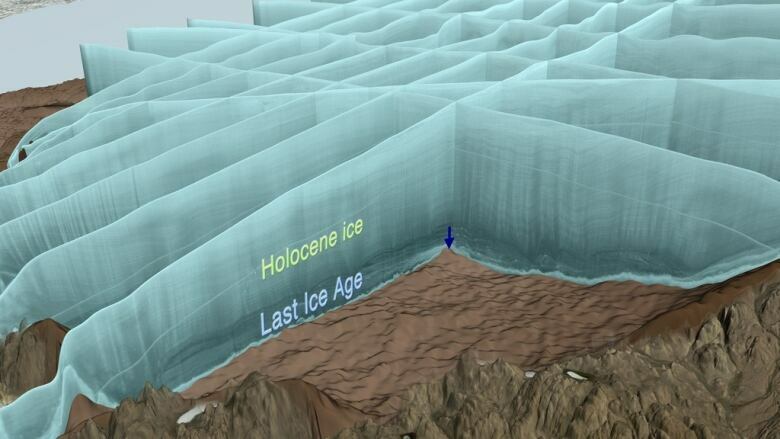 The ice sheet in the region of the crater that has formed over the last 12,000 years is undisturbed. However, the layer of ice underneath shows signs of a violent disturbance. "We saw folding, we saw disturbed layering, we saw debris entrained within the ice," said MacGregor. This suggests that the crater can't be younger than 12,000 years old. But they can't rule out the possibility that it could be considerably older, perhaps nearly as old as the Greenland ice cap itself, which formed about 2.6 million years ago. If it is indeed only about 12,000 years old, it would be the youngest large impact crater known on Earth, and would mean that the asteroid hit when modern humans walked the Earth. Soil samples from around the glacier confirm that the impactor was an iron asteroid that directly struck the Earth, generating as much energy as 700 one-megaton nuclear bombs. "The impactor itself, which would have been more than a kilometre wide, would have plunged into the Earth's crust, several kilometres deep, before material would have collapsed [...] leading to the final crater that we see today," said MacGregor. An impact like this could have been strong enough to change the currents in the ocean. "If it hit ice, we can expect quite a bit of water would have been vaporized, and melted," said MacGregor. "We're talking about billions of tons of ice." This water vapour would have circulated in the atmosphere, and eventually would have condensed and rained out onto the ocean. That influx of fresh water would have rapidly cooled the surrounding North Atlantic or Arctic Oceans, changing the ocean's circulation, affecting weather and climate around the globe. Solving an Earth sciences mystery? The discovery of this impact, and the fact that it might have been so recent, offers a tantalizing possibility to scientists. Around 12,800 years ago Earth was in a warming period at the end of the last ice age, when something happened to suddenly plunge the planet back into a deep chill for a thousand years. This might have contributed to the extinction of large mammals like the mastodon and ground sloth. A long-standing theory, called the Younger Dryas Impact Hypothesis, suggests that it was an asteroid that caused the cooling. But until now, scientists have never found a crater that would be evidence for such an impact. "What is intriguing about the Hiawatha impact crater, is that it is not only big enough and in roughly the right location to cause the sort of effects that the Earth might have experienced during the Younger Dryas Cooling Period, it has some geochemical links to some of the better evidence for that hypothesis," said MacGregor. But, he cautions, that all depends on when the impact occurred. "That's an interesting set of coincidences, but coincidences don't make fact," he said. "We're certainly interested in exploring that question further." MacGregor thinks the novelty of the discovery means that this might lead to a whole range of new investigations and expects there to be many more craters discovered hiding under the ice. "I think it's certainly possible, and in fact probable, and I imagine many folk will go looking." What are the major visible changes in the night sky in the last 3,000 years?